Today we’re proud to present another DIY project from a fellow Doing the Stuff Networker. Jamie Burke is a master at repurposing trash and junk. His latest project shared on our DTSN Facebook Group not only saves money, but would be very useful both now (free is always good) and after a SHTF event. If you’d like to see more of how he and our other members are Doing the Stuff, join us on our journey to self-reliance and preparedness! 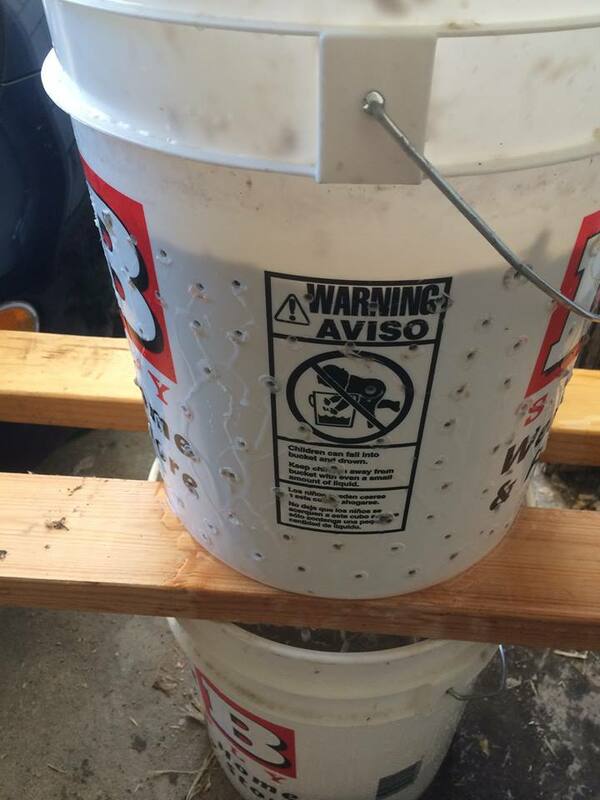 This process only requires: Two buckets, a drill (or stabbing weapon), piece of wood (or bottom of another bucket), kinda a custom drill bit, water. + your TRASH! 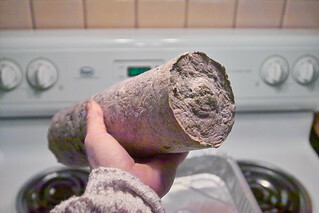 Out of all of the physical spam you receive in the mail, leaves you rake, dead foliage, paper towel rolls, paper plates, napkins, beer boxes, egg cartons, etc., etc., etc., (any biomass material you can think of) – why not turn it into useable logs for your furnace, campfire, or cooking? Just don’t use the plastic coated things. I’ve seen ‘devices’ you can buy that makes ‘newspaper logs’, but they never seem efficient, require you to pre-shred, take way too much time and the logs are not very solid. This is a much better method and doesn’t really cost anything. Place the holy bucket inside the other normal bucket. Start putting your papers, leaves, bio material in it. Add your water and fill’r up. Doesn’t really matter if you have too much water. You can leave these buckets of water setup by the mailbox, then just walk by and toss stuff in. You need a custom drill bit, which I have. A good thing to do is find an old table saw blade and weld it to s shaft of steel. This is “the hardest” part of this setup. Drill away and in seconds you will have a nice pulpy wet mess. Next, pull out the holy bucket and let it drain. 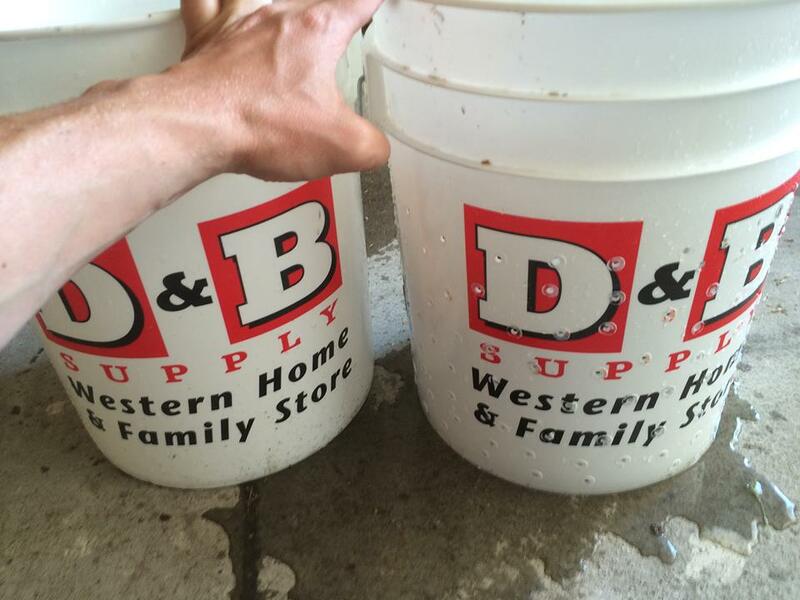 I put the draining bucket on top of the other bucket to save the water – you can re-use the same water many times. You should have a press that goes far down into the bucket to press out the remaining water. I found a bucket that someone cut the bottom off.. well perfect. But you will probably want to place a bucket down on some wood, trace around the base and cut out that piece of wood to use as a press. Pulp on the left. Found this next to my house (press). Or just trace a bucket on wood and cut out the wood piece for a press. Set your press inside the bucket over the pulp. 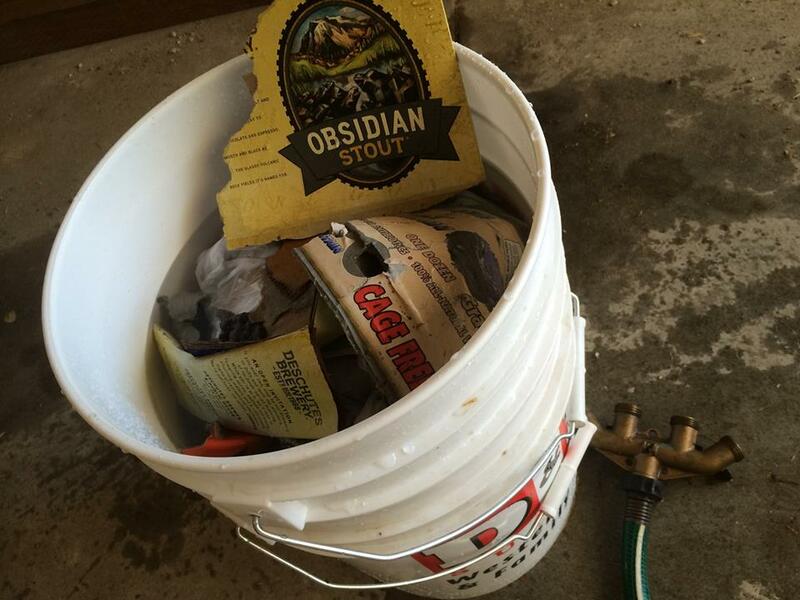 Then I set the re-used water bucket inside of that bucket (because water is heavy). That will work over time. I also sat on it.. put my anvil on it.. and stood in it. It’s pretty quick. whatever heavy you have for the top. Now once most the water is pressed out – take it out to a sunny/dry place. Turn over the bucket and tap on the top. It will take some time to dry, depending on your location. We live in the desert so this will happen fast. If you want it to dry faster, cut these logs as you would a pizza, into sections. Once dry, these will burn a long time.. and cost you ~ nada. Free firebricks dried in the desert! Todd’s note: Hope you enjoyed Jamie’s tutorial. He’s a fine example of people who have traded theory for ACTION! Come check out all the other folks busy Doing the Stuff! If you try it yourself, we’d like to know how it turns out. I thought you said, Firebricks?” I wanted to know how to make “firebricks,” not paper bricks that would burn up in the fire. Sorry for the misunderstanding. We’ll have to do a diy firebrick post just for you. Then you can burn this ‘firebrick’ in your real firebrick oven. Fire cake may have been more appropriate, huh. I’ve actually been experimenting with making a fireproof paper brick for a 13-brick rocket stove, (unsuccessfully I might add). That’d be cool to see, trampart! Keep failing forward! I to started reading as was thinking fire brick for my stove,so,will look forward to a “fire brick” writeup,will say,have found em pretty cheap at a nation wide supply store but just like making things,keeps me out of getting in too much trouble! I agree with you. I was disappointed. I’ve got 100’s of paper brick I want to know how to make firebricks! Buy fire bricks at Home Depot for a $1 each and get over it already. Another option if you don’t have that fancy custom drill thingy is to get an old blender and blend some of the pulp up a little at a time. We use to use the blender method to make recycled paper. It would take a little longer, but would still get the paper into pulp. Also, I was thinking you could take the squeezed pulp and smoosh it into smaller containers (butter tub, bottom of milk carton, etc) to get smaller “bricks” or different shapes. I saw a guy make a squeezing device out of a piece of PVC pipe and a caulk gun. It spit out hockey puck sized fire starters. He had a Youtube video on it. Thanks for the comment and ideas, Tina! make them in an ice cube tray. I use a concrete mixing bit. Also… I use small rectangle laundry buckets. Great use for junk mail! I’m curious how much smoke these put out – how fast will the chimney need cleaning, compared to firewood? I like the idea of different sized containers. I am a woodworker so if I made one say, oh, 6″ wide by 8″ high by 16″ long, and put a board on top of the mash, I could use my woodworking clamps to squeeze it together and make a square log. How long will these burn for? Use an old paper shredder? A shredder would work for paper but cardboard would take something substantial. Good tip, K! a 12 sheet crisscut shredder will work however it’s best to load cardboard with ripples(corrugation lines) horizontal to the shredder. You can also lube the board with vegetable oil to keep the shredder running optimum. I remember in the Girl Scouts many years ago we learned to make logs out of old newspaper. You would roll them up tight as possible and secure with twine. Then you would soak them in water for a day or more. And then let them set out in the sun to dry, which took several days to a week+. We used those on our camp outs along with regular wood, but our newspaper logs always lasted longer. How long do you leave the cardboard soaking in the water? Jamie, the author, could tell you more. I’m thinking until it melds into a mush. 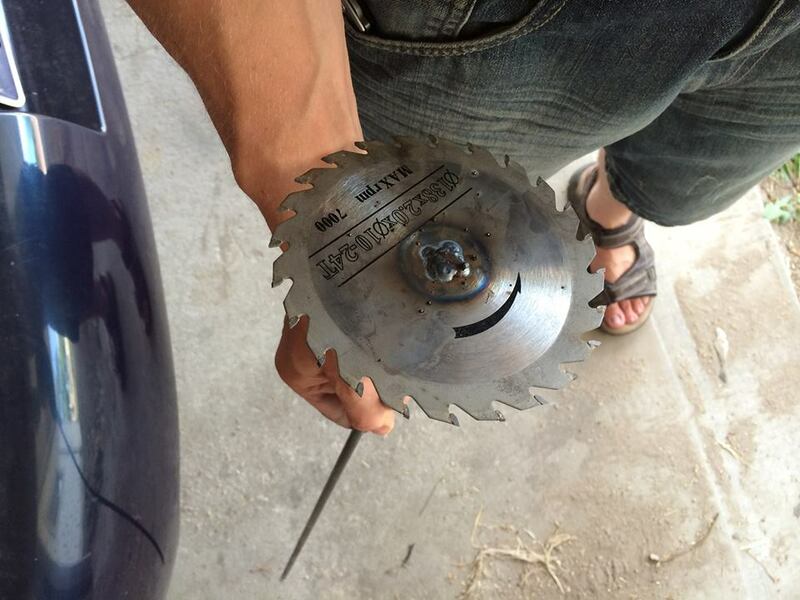 Doesn’t really matter if you are using a power tool to grind it fast. over night is cool if you have to use a hand tool though. Makes it easier if it’s not a powered tool. Hi I use my garden mulcher and then put the shredded paper in a garbage bin we used to have at home two thirds fill it then fill the bin nearly to the top and mix with a paint stirrer, I used my mix wet in compost or as a base in a worm farm,I have also put wet in steel pipes and pressed it on my home made steel press and gave dried paper ingots to friends as they have fire places wich I don’t have , good for mates when they get to old to cut or split wood ,they are very happy. How hard are they to light? Hi Sue, I’m not the author of this post but Jamie posted an update on the fire logs on our FB group page. He said they burned for almost 2 hours. I’ll check on your ignition question for you. Not real sure about that one, Sandra. I’d do my own due diligence before cooking. In an emergency, I’d use them if that’s all I had available. Let us know what you find with your research, please. Thanks for the comment! If you consider this to be a chunk of wood about the same size.. that’s about what it’s like. Need a fire or coals going good before tossing this size of wood on to get it going. If it was chopped up, it would start faster, just like wood. I Love the Idea , we now have Gas heat but if we still did a wood stove this would be a great way to use up the excess amount of paper products the are everywhere.I use a Paper shredder and shred the paper to put in our Compost! I think it might work nice for this project also! Keep in mind that while you are getting toasty warm inside burning your “fire bricks”, it usually smells like someone is burning trash outside. Ans, if you add parafin wax as an accelerator, it smells like someone is burning garbage. Does the safety of cooking food over a fire of this, depend on what u put into it when making them? What’s food-safe or not to put it? Anything to create more surface area would increase the O2 which is one of the legs of the fire triangle ~ heat, oxygen, and fuel. You also must make sure it is totally dry then put it in a dry place. Try drying for a month in the sun, and on humid or rainy days bring it inside. After that leave it inside for a month by a sunny window. What a way to use the paper feed sacks that we get! I know better than to use the wax coated/plastic lined dog food bags and the plastic ones, but being we get up to 6+ paper feed bags a week. We also go through a lot of paper towel (the brown stuff) with the dairy goats……. That could go in. Left over newspapers……. And the blasted liberal AARP junk mail! That would totally work, Tami! Appears that you’ve plenty of stock for the pulp. Thanks for the comment and let us know how it turns out. Check out rocket stove briquets on. Youtube I made a. Press out of scrap treated lumber and I get large bags of shredded paper from work. I can make about 18, 3in x 2in in an hr with a 4in pvc pipe,they burn for about 1/2 hr. Check out youtube rocketstove briquets easy to make aand burn for about 1/2 hr. Shredded paper has more surface area and would turn to pulp quicker. 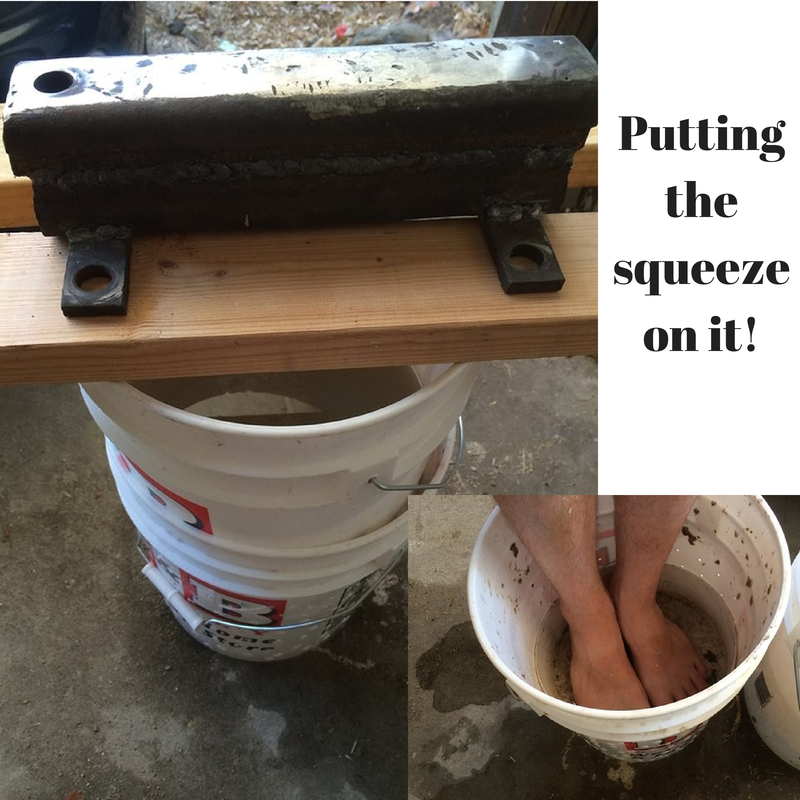 If you don’t have access to a paper shredder, soaking the material makes it easy to break up with a tool, DIY or homemade like Jamie made. Would these work in a regular fireplace? 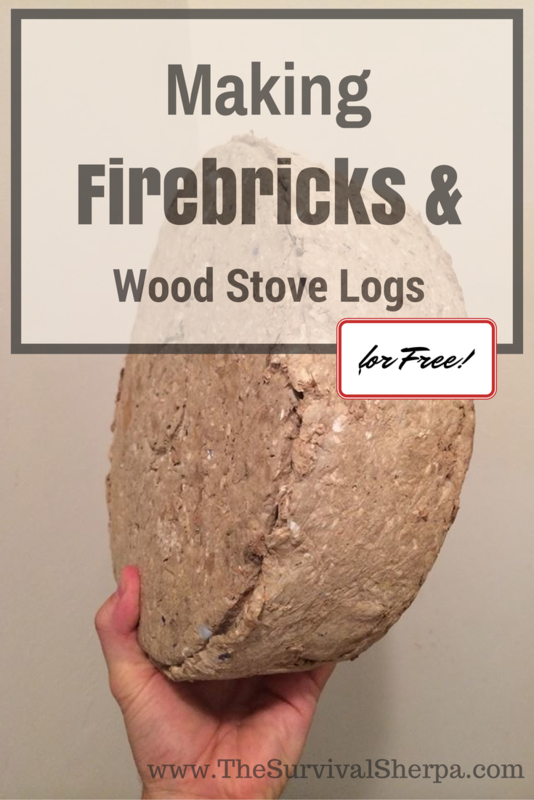 As mentioned earlier on posts some including me first thought this was making firebricks for your wood stove,something was interested in but seeing tis a lot of work and would need a kiln a bit much for me when available inexpensively at moment,yes,have many extras.I would rather spend time on projects am equipped tool wise to handle now,for example making a survival gig,do have knives and sapling a plenty! I live in Haiti and trash is something we are not short on. Also, one of the biggest problems here is deforestation. They cut down the trees to make charcoal for cooking. Would this be something safe to cook on? I saw Randall Schreurs posted the same sort of question but couldn’t find a response. Could be a great way to solve two of the major problems in this country…. 1: That would depend on what you put in there. If you put in leaves, cardboard with no paint, wood with no chemical treatment, etc – all is good. 2: You shouldn’t be cooking over flames, only coals. At the coal stage, anything is safe. I’d treat it like using pallet wood for cooking. Basically get coals and cook. Unless you know the pallet is toxic free, then cook over flames. But you shouldn’t cook that way. Unless it was in a pot (dutch oven), then nothing matters – go for it! Depends on what you put in it. Just as ‘would you put in a beer carton in your wood-burning stove now?’. Just depends on your trash and what you would want burning in there. As a teacher I see a LOT of paper being discarded every day. If anyone wanted to make a lot of these, checking in with the staff of your school–custodian and/or principal–and getting them to set aside whatever was clean paper from the copy room (trimming from paper cutter, boxes that the paper comes in, reject first few copies from a big run on certain machines, etc. ), and you’d be all set. And maybe this could be a project that the students participate in. They have a winter camp out at our elementary and starting a fire is part of it. Anyway–great project, and thanks for it to all involved. I make smaller versions of this biomass fuel block. A 16.4 oz. propane bottle fits perfectly inside a 6 inch PVC tube. I put a few handfuls of the pulp in a 12 inch PVC tube with holes drilled near the bottom, insert the propane bottle and press out the water. 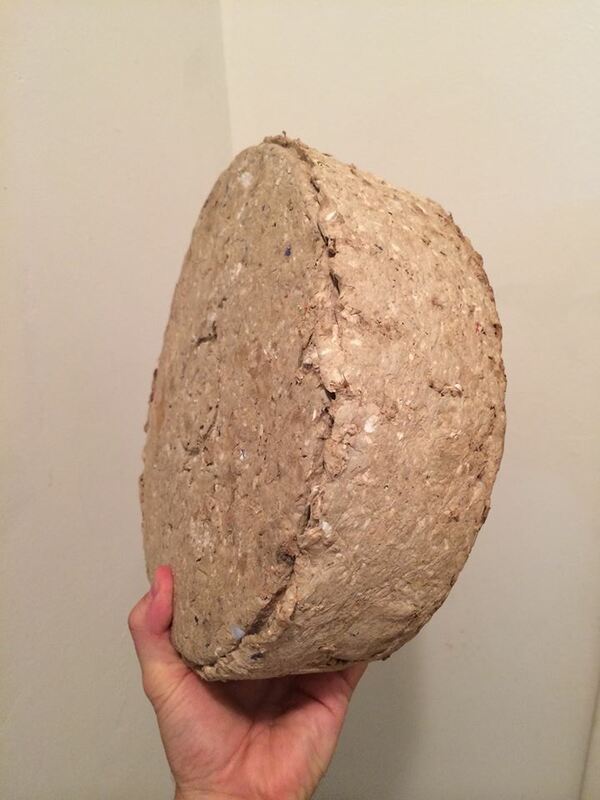 I get biomass wads about 2 inches thick and 6 inches diameter. These take a few days to dry, so I would think that the bucket sized ones would take a week or more to dry through. Be SUREto always use FOOD-SAFE plastic buckets. Icing buckets from your local supermarket bakery are perfect. Addendum to my reply, above. Use FOOD-SAFE plastics for making cider. I tried this a while back using a bit of soap in the mix to hold it together. worked great except for the Florida Humidity which made them soggy after a while. Used a length of 4 inch sch40 and a press I made for a four inch flange to make logs. Not if you look around at yard sales for discarded, half-used candles. or kids crayons if you know someone who busses tables at a restaurant that gives them to kids to color with. They’re always left behind and thrown away. Wax? Old trash candles and crayons? What about using the wax that is discarded from Cheese, could it be used also…..
You should change the name of this. It is NOT how to make firebricks. The title is misleading. Firebrick (logs) is in the title. Change it to fuel brick. HI, wasn’t able to get firewood this summer–thinking about doing this…will it gunk up the chimney?? Great idea! I have been using paper bricks for a few years now. Are these safe for wood stoves? The paper has inks which are highly toxic. What do you do with the water afterwards? I’ve been experimenting with leaves and sawdust… Haven’t burned them yet but was thinking that if SHTF that would be available. Most ink in the US is now soy based rather then petroleum based. Doing things with out a “company” will be more important then you can know. Collect and make your plans well. Well I for one will be giving this a go. I love the word FREE. And with the JUNK mail it will be FREE. How long do these burn and how hot do they burn? I’m working in a poor country and am wondering if these would be beneficial. I also thought this was about firebricks. 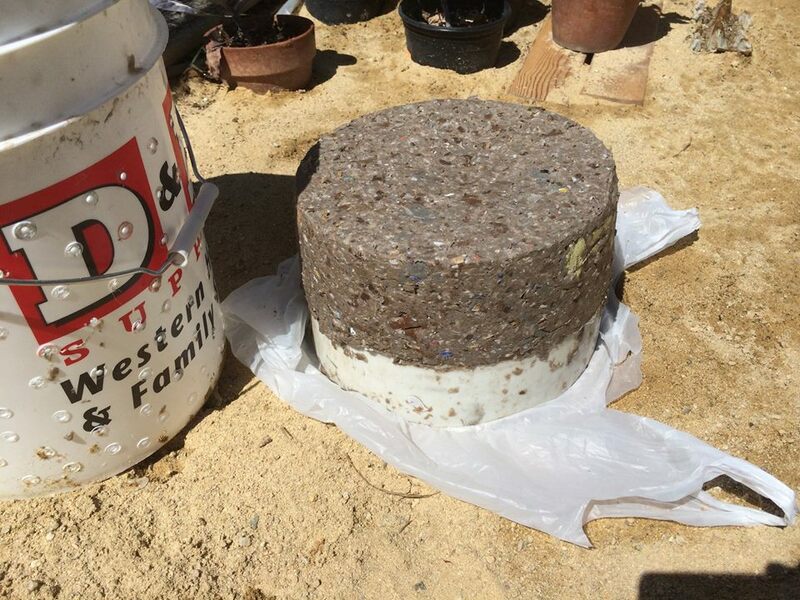 My family made firebricks using salt and sifted ash that was baked in the fireplace. I haven’t found anything on the internet describing making these firebricks. Mike, I’d love to hear more about the process your family uses for making firebricks. Great idea… Like ratchet straps? Right? Suggestions that I have gotten is that they are for adding to an already burning but I was thinking that if I make smaller and bigger ones I could infuse smaller ones with wax and it would be more like a firestarter recipe but would solve that problem but I am still in the experiment stage. I have been doing this for years with great success! I purchased a small used concrete mixer that came from Harbor Freight for $50 and toss all my cardboard, shredded office paper, about 4 cups of sawdust shavings from my shop, dried leaves and twigs in with some water and let her rip for about 10 min. That’s all it takes. Then I poor the slurry into capped (with many small holes drilled in it) pvc pipes 2 foot long. I put a smaller cap inside and use my pipe clamps to press them into logs. Some times I put a cup of pulverized candles I get from the thrift store for really cheap in the mixer at the start. Next I am going to try adding some corn cobs but I am sure I will need to run the mixer a little longer. Oh, I also put in about four 3-4 pound round rocks in with the whole mess. They are easy to fish out before I pour the slurry and they do a fantastic job of mashing. Sounds like you’ve got a great operation going, Thomas! The candle wax is a brilliant add, sir!! Thanks for sharing how you’re doing the stuff of self-reliance! Love this! 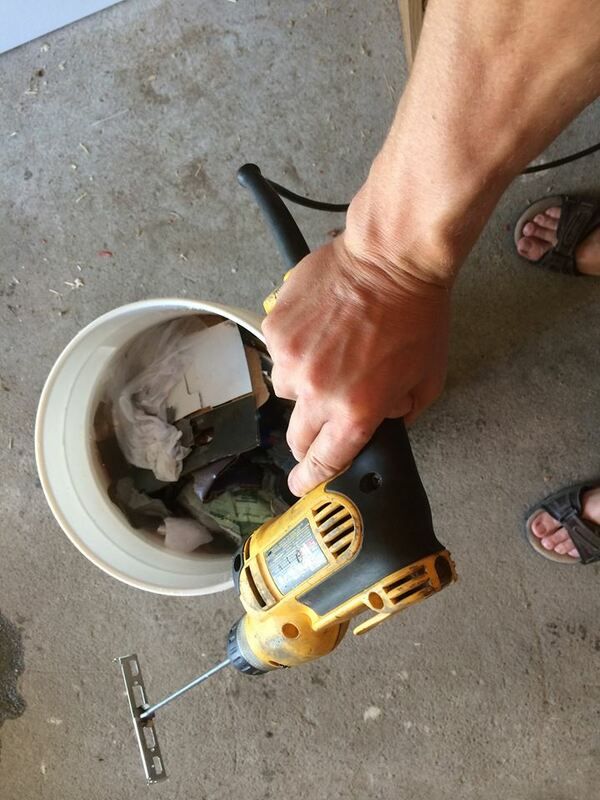 Do you suppose a drywall compound mixing bit would do the trick if the papery mess got soaked for a few extra days? And any tips on storage? I use a concrete bit that I took a grinder to the edge of to make it sharper. I wouldn’t do that. There might be sawdust from pressure treated wood. Never burn pressure treated wood, especially from an older deck or structure. The older stuff contains arsenic and the newer solution still contains copper, and it’s not advisable to breathe the burnt fumes of it, either. Creasote buildup in a short time. That would almost fit perfectly in a chimney pipe. I bet it burns good and hot too! Cool idea but probably not the best choice for indoor heating. I’ve been making the fire logs since last fall, I’ve gotten addicted. It does take them a while to dry but burn great if used with regular wood. Really stretches the wood supply. Good heat output. Awesome idea! But if you wanted to do this on a regular basis maybe buy a small cheap electric cement mixer so you could make bigger batches and pour it out into multiple buckets. Definitely cost you some, but would greatly increase the volume. As for fire bricks, you need to add clay to the concrete. I didn’t write the post. I member of our Doing the Stuff network shared this in our group. I’ll take a look at the vid. Trying to find how to build a good paper shredder after the paper has been soaking. Anyone have any step by step videos or instructions? I only have a batter operated drill. Thanks for the help. Firstly, I respect the efforts in sharing this work and always looking for ways to save energy & money. As soon as I have to use an electrical item, be it a drill or shredder, I immediately want to work that out and try to understand what are you saving really, efforts put in yourself are free (unless you want to put an hourly rate to your projects). I have been making these bricks for a while, I have a wood burner in my garage and use them there, I soak paper in large buckets for 2 weeks and press them in a metal hand press, I dry them in my greenhouse. I do own a shredder and do shred paper for security reasons, the rest I hand tear. My wife works in an office that use a shredder and she collects bags of that, so we don’t try to add energy to the process. I would like to know if anyone has worked out the energy of what one of these produces. One day I might get round to working this out by lighting one under a pan of water and working out the BTU. Btw, I was not disappointed but thought this was what I was getting when I read the title. One thing I noticed in that You Tube video is he didn’t pull the plastic window out of the pasta (ziti) box, and I would definitely remove all plastic. I wouldn’t want the chemicals added to the fumes. It cannot be a good idea to burn any amount of plastic in your home. Toilet paper tubes could be tossed in the mulch, and my family goes through plenty of those. This is fantastic and I am trying it. As I type my buckets are draining. However, I have one question. 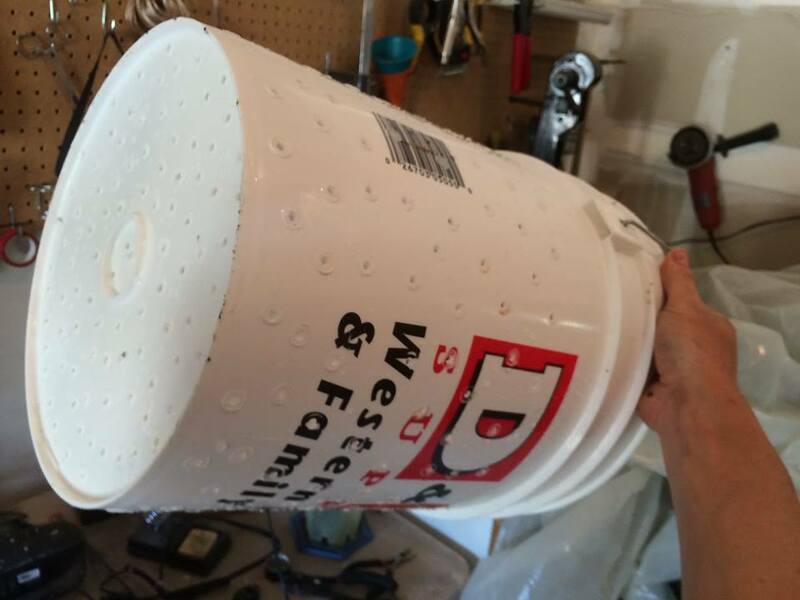 How long should I let it drain before I flip my bucket and knock out my mold? Awesome setup I’m doing the same as im typing this. I have let my paper soak for 3 days now as im waiting on my day to make our blender. As for cooking I would look into the $6 rocket stove on YouTube. 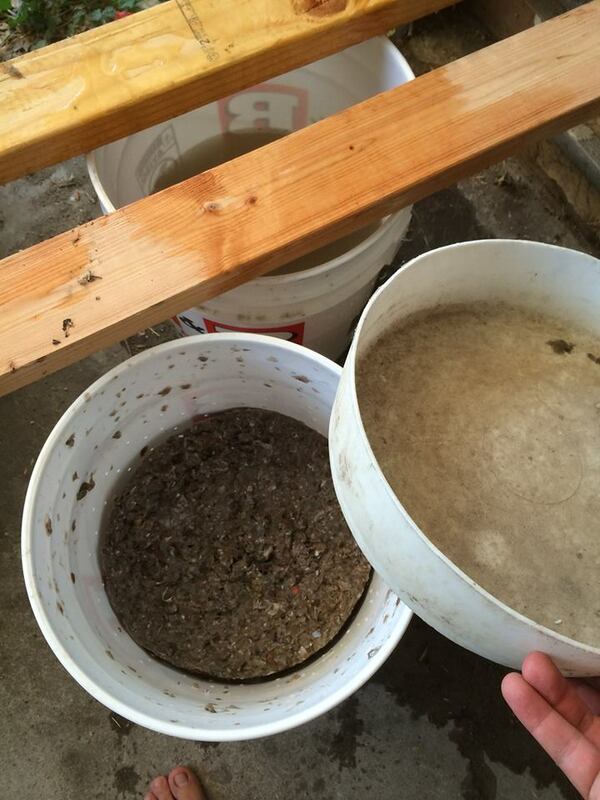 As for letting drain I would later it drain until all the excess water is out then take a third bucket and fill it with sand and water and sit it on top as a press for at least a few hours so after all the water is pushed out it would actually start to dry like that. that way you could be sure it would be as tight as possible. Thanks a lot for your instructions of how to make firebricks. I wood like more instructions, simply because I use to build so many Houses but they want firebrick to build the the wood kitchen! Thank you! Hmm, I made this exact recipe & even made a press out of a shop press, but my bricks just don’t want to burn much. I’m using cardboard & junk mail. Some recipes add sawdust, but I don’t produce much & no one around here wants to give theirs up. Check at some of your high end Hotels that put out Newspapers for the guests, only need one or two to keep you in paper, like the idea of leaves, especially when all the neighbors have got theirs bagged up, sure they will give them away free. This will reduce trash going into landfills. Awesome! Found it handy to use pvc pipes 4-6” dia. When forming “LOGS” for Stoves or Fireplace. Make a ram from PVC to remove water and wooden post to push out log. Cool deal I am going to try your process. I am wondering if a bucket is wholly and did you weld the slayer? I think my time is better spent cutting firewood. Wow amazing and I get lots of junk mail! Thank you so much for this idea ,and it’s recycling at the same time! Thanks for this great idea. My Girl Scouts are learning about different fires. This would be a great project for us to try although we may do it on a smaller scale. How can anyone make bricks from fire? Never heard of it. Fire bricks are made of literally debris like wood and newspapers, etc. You can enter your email in the subscription box on the upper left hand corner of the blog page to subscribe. Thanks for following along! Ya, I’m just wondering what all people put in these things. I know junk mail, but I’m thinking maybe used tea bags, coffee grounds, maybe even fruit and vegetable scraps. If it’s going to be dried out anyway, what’s it matter? Any other ideas? Thanks for sharing this great Prepper idea. Gonna give it a try in a couple of days. Thanks again and will look forward to many more great ideas from you. Thanks for all you do: Keep on Preppin’!